Traffic travelling through Stonehaven at peak times could increase by up to 100% during upcoming AWPR construction work, Aberdeenshire Council has warned. However, officers hope the disruption will be reduced after the first four weeks of the 42-week project. A section of the A90 at Stonehaven will undergo siginificant redevelopment from next week, as work begins to demolish a bridge carrying the trunk road over the B979 Netherley road. A contraflow will be set up from next Tuesday (March 21) and will be in place until winter 2017/18, which will allow the part of the existing bridge carrying the southbound carriageway to be demolished and reconstructed. Once these works are complete, the contraflow will move to the new southbound carriageway to allow the remainder of the existing bridge carrying the northbound carriageway to be demolished and reconstructed. A report prepared by Aberdeenshire Council stated that a recent trial of the contraflow system, which ended on February 26, saw traffic travelling through Stonehaven to avoid the A90 between 5pm and 7pm increase by approximately 200 vehicles per hour. To reduce the impact of traffic travelling through Stonehaven, a completion of a new southbound sliproad has been moved forward to April 14. “The new southbound on-slip will provide an alternative route for vehicles using the B979 to bypass the roadworks, allowing them to re-join the A90 without passing through Stonehaven. This may require a traffic light controlled junction either full-time of peak time. The detail of the junction layout is still being designed. “Unfortunately the sliproad cannot be constructed prior to the programmed date for the implementation of the Contraflow on the A90 and the additional diverting traffic will go through Stonehaven for a period. “The contractor has given a written commitment that the sliproad will be in operation by April 14 2017. Consequently, based on a start date of march 20, the additional peak time traffic will be going through Stonehaven for four weeks. “While it would be desirable to have the slip road in operation prior to the implementation of the contraflow, delaying the introduction of the contraflow, and consequently the start of the bridge works, till after the sliproad is open will have a significant impact on the opening of the junction. This could result in the bridgeworks extending through Christmas 2017. “On balance a short, defined period of disruption, of around four weeks, is preferable to a potentially undefined period of additional disruption in the autumn/winter months. 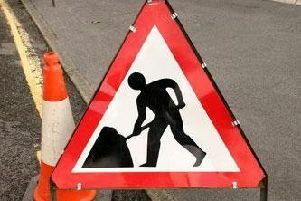 The contraflow on the A90 will consist of two lanes of traffic heading northbound and one lane southbound. All traffic will initially be using the northbound carriageway. The contraflow is expected to add between 10 and 20 minutes to journeys during morning and evening peak travelling periods for road users heading south. A Transport Scotland spokesperson said: “The works at Stonehaven will involve the demolition and replacement of the existing bridge carrying the A90 over the B979; widening the B979 Netherley Road; the construction of new slips roads to and from the A90; and the creation of a new roundabout, which will form the junction between the AWPR, the A90 and the B979. “These extensive works, which will be on-going until winter 2017/18, will be undertaken in close proximity to live traffic on the A90. Therefore, to ensure the safety of workers and road users, it is necessary to put in place a range of traffic management measures, including ‘get in lane’ and ‘stay in lane’ signage on the northbound carriageway, ‘use both lanes; and ‘merge in turn’ signage on the southbound carriageway, average speed cameras and temporary barriers. These measures will enhance the safety of road workers and road users. “It will take time for road users to become accustomed to the new road layout at Stonehaven; therefore, we are strongly encouraging road users to apply more caution than usual when driving through or nearby this area. Road users should also observe the 50mph speed restriction on the A90 and all road signage to enhance their safety, as well as the safety of others. The existing A90 northbound slip roads will remain open throughout the works but will be subject to speed restrictions, local realignments and occasional overnight temporary traffic lights. Further information on upcoming weekend road closures of the B979, between the railway bridge and the existing A90 bridge, will be announced in advance. These road closures are necessary to enable the bridge to be demolished safely.